Driving fifty year old cars is always an adventure. I’m amazed at how well I have been treated when these old cars give up the ghost. Readers of the column will recall the roadside repair last June when a fan bolt came loose in the Puddle Jumper while on a tour to Saratoga, NY. Not only did the car stop within a stones throw of a shop that had the air power I needed to reassemble the fan, but it also produced a lead, as yet unfulfilled, of another 356. A few weeks ago I arranged to meet some of our 356 Registry members at the first rest area on the Mass Pike westbound after Rt 495 for a drive out to a tech session at a members shop in Ravena NY. The plan was to then drive back to CT that evening to be close to Lime Rock Park for the annual Sunday in the Park car show the following day. I had registered the Speedster for the show and was going to take it in, rain or shine. The weather was great as I blasted up Rt 495 to the Pike, but as I rolled down the on ramp I smelled something burning that didn’t smell quite right. With an open car all sorts of smells show up as you drive along, so I wasn’t really concerned. I had already gotten a whiff of the cow manure in a field in Millis, the smell of gas from a station on Rt 109, and diesel smoke from an 18 wheeler I passed. 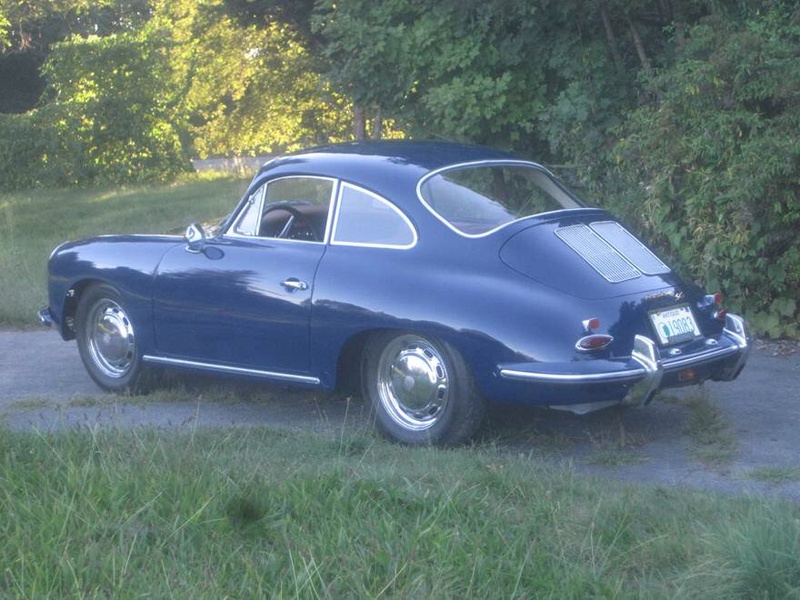 This had sort of a plastic odor to it, and since there really isn’t much plastic on a 1958 Porsche, I just ignored it. It was less than a mile from the tool booth to the rest stop and with an EZ Pass on the dashboard, I covered the distance in about a minute. I rolled into rest area parking lot at a pretty good clip and spotted another Tub so pulled up nose to nose. Imagine my surprise when upon stopping, smoke started billowing out of the front of my car. The first thing I thought of was that the front hood seal wasn’t working. The second thing I thought of was that the engine was in the back of the car, not the front. The only thing up front is the battery and the gas tank, not a good combination. I pulled the hood release and jumped out of the car. Opening the front produced even more smoke, not a good sign, and it smelled like plastic. It was me all along. Of course the front of the car was loaded with gear so I pulled out the tool box and the original tool kit that I use for display. The jack had to come out next to be able to remove the spare tire that covered the battery, but the spare was held in place with a fabric tire strap that didn’t want to release. The battery is held in place by two springs that hold a cardboard cover over the battery, but my reproduction cover was made of plastic(!). 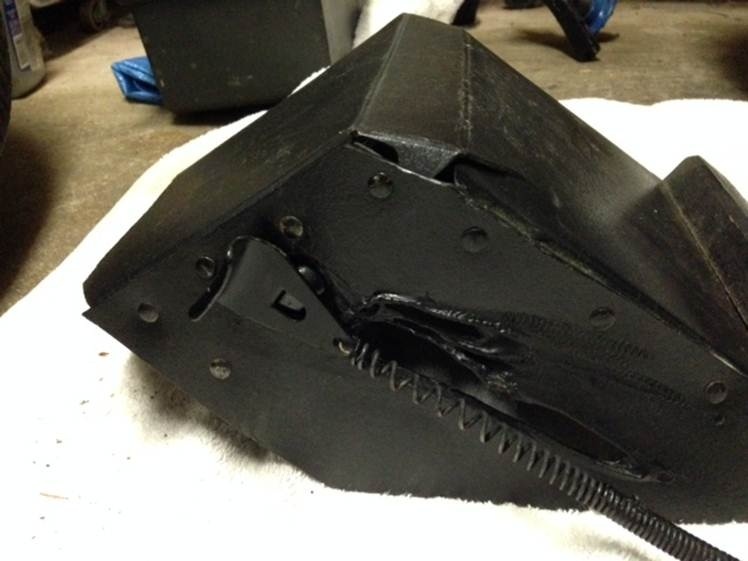 Somewhere in the last few minutes a bump in the road had moved the battery enough to cause the positive terminal to contact a piece of metal inside the box that was connected to the chassis by one of the hold down springs. That caused the spring to become heated like a light filament which promptly began melting the plastic it was leaning against. That was the source of the smell and also the three burn marks on my finger as it took three tries to get the spring released so that I could move the battery away from the metal strip to stop the burning plastic. Another member was at the ready with a fire extinguisher, but except for a short test squirt, it wasn’t needed. The heat also took the tension out of the spring as can be seen in the photo, but I have lots of those so except for the plastic battery box, there was no real damage. Now consider for a minute what would’ve happened if there was no planned meeting at the rest area and I was just westbound on the Pike for a couple of hours. These cars will run once started, whether there is a battery connected on not. Which means that I could’ve been motoring merrily down the highway while the heated spring did its best to start a fire in front of the gas tank. As it turned out all that was needed was to remove the battery cover, wrap a towel around the terminal to protect it and we were off without any delay. After that shaky start the weekend went very well but it got me to thinking about how lucky I’ve been concerning roadside breakdowns. The Volvo 544 is a recent example. When I first got it there was enough debris in the fuel system to stop it on the road, but both times it was only blocks away from a repair shop that knew what to do. Once I drove it to the train station in Stoughton and stopped to get gas and it wouldn’t restart. But I was only 2 blocks from the Randolph Racing shop and a phone call got me to the train on time and Kevin went back to find the points stuck shut, an easy fix. Again no delay, thank you. Last week I went to get the 544 from its garage spot in Millis (read extra storage bin) and as it was idling while the 914 took its place, it died. It never just dies. A quick look found that what was low on gas, was actually out of gas. I haven’t had it long enough to know how far down the gauge really goes. No problem, I just rolled the 914 back out of the stall, went home the 3 miles , got the can of gas, came back and continued on my way. No real delay but if it had died half way home it would have been a real problem. Hello, AAA. A couple of seasons ago at the BMW ice races the Audi decided to give up its gas pedal. It just went to the floor and didn’t come back. And this happened when I was waiting for my run out in the middle of Newfound Lake, NH. What location do you give the AAA tow truck driver? As it turned out the ball socket had just popped off under the pedal and after poking around for a bit I found the problem and I was on my way. It never came off again. A ’63 356 that came through my driveway last year needed an engine swap that was accomplished in a couple of evenings and while out for a test drive it was running great until I hit a bump, all the dash lights came on (OK, both of them, it’s an old car) and the engine stopped. I was on a two lane road in Sherborn with no shoulder when it died but I was doing about 30 mph with two cars behind me. I went around a curve as the car began to lose speed but there on the right was a fruit stand with a large area for parking. I pulled in like that’s what I had come for and went back to find that the positive side of the coil wire had fallen off. It was just a push on connector so I pushed and the problem was solved. Thank goodness for fruit stands. I helped a friend do a color change on a ’64 356SC this summer, one that we had found in Maine. It came with the correct engine that according to the seller that was completely rebuilt but had been sitting for a ‘few years’. I really don’t like to just plug in someone else’s work and hope for the best but once installed, the engine turned over fine, the valves adjusted easily and it was clean as new, so in it went. I guess that when it comes to break downs, I’ve really been lucky. Of course better luck would be no break downs, but we are working with 50 year old cars here and stuff breaks. The real contest is getting it going again with a minimum of delay. When the car your driving is as simple at these Tubs there are only a couple of things to check, gas and spark. You have to have them both or you’re not going anywhere. The victory is in the fix, being able to overcome adversity is the real satisfaction in working with these old rides. Anyone who has an old car gets plenty of chances to come out ahead in that contest.